A math learning game starring characters from the arcade game Donkey Kong Jr. 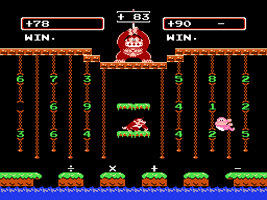 Calculate is a game for two players, Donkey Kong holds up a number and the players must compete to gather numbers and calculation symbols in order to reach that total. In Calculate B, the numbers may also be large or minus numbers. Math Exercise is a one player game where players are given a series of problems and have to work out the answers. Get them all correct to win the game.